This paper proposes the plan and implementation of a non-linear controller for a doubly fed induction generator (DFIG) to supply support to power grid operation. The controller associates with voltage and speed regulator that guarantees the active power and reactive power delivered by the generator square measure mechanically adjusted to support the grid once a modification happens. Simulation results square measure enforced by mistreatment Matlab Simulation. Wind energy is the fastest growing and most widely utilized emerging renewable energy technologies in electrical energy conversion systems at present. This high penetration of wind energy in the power system has been closely related to the advancement of the wind turbine technology and the way of how to control. Integration of wind turbine based on doubly fed induction generator (DFIG) into the electrical grid has become an important part of electrical generation in many countries and its importance is continuing to increase . Therefore, the analysis of wind power dynamics with the DFIG wind turbines has become a very important research issue, especially during transient faults. Wind turbines should remain connected to the grid when severe faults occur while supporting the grid voltage and frequency during normal operations. Several researchers are still investigating the best control system for wind generators with these new operating constraints. Feng et al. gave a feedback linearization based nonlinear voltage and slip controller is proposed for a DFIG connected to an infinite bus. A direct active and reactive power controller based on stator flux estimation is discussed in study by Lei et al. . This paper proposes a basic hysteresis controller. In a study, Muller et al. , the well-known vector control is proposed to regulate the active power and reactive power generated by a DFIG. In a study Hughes et al. defines  a DFIG control strategy that is very similar to the conventional Automatic voltage regulator for synchronous generator is utilized to support the power grid voltage and frequency. The main drawback of the aforementioned works is their inability to cope with large changes in grid parameters. DFIG has more advantages compared with other wind generators. A wind power generation system equipped with DFIG requires a converter with only one-third of the power rating, leading to a less expensive system with reduced power loss. It controls reactive power separately from active power with a reasonable adoption of orientation frame. 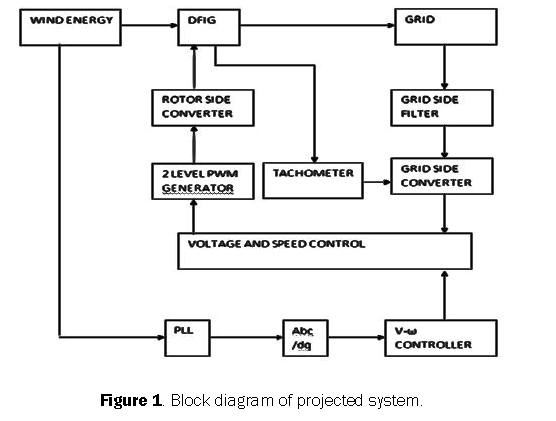 This paper proposes a PI control strategy that makes possible for a wind generator to adequately support the grid voltage and frequency. A fast responsive controller is proposed so that it’s possible to follow changes that occur in the power grid . In Figure 1 The diagram of DFIG connected wind system is shown. The grid and rotor aspects of the controller has been enforced within the projected system. A PI management is employed to stabilize the grid voltage. Figure 1: Block diagram of projected system. The turbine converts the K.E. within the wind into mechanical power. And this mechanical power are often used for specific tasks or a generator will convert this mechanical power into electricity to power homes, businesses, schools, and therefore the like. The DFIG at the present the system of selection for multi MW wind turbines. The principle of the DFIG is that rotor windings square measure connected to the grid via slip rings and succeeding voltage supply device that controls each the rotor and therefore the grid currents. An electrical grid may be a network of synchronized power suppliers and customers that square measure connected by transmission and distribution lines and operated by one or additional management centre’s. Once the majority observes the facility grid, they're relating the gear for electricity (Figure 2). The rotor is the heard of a turbine. It consists of multiple rotor blades connected to a hub. The rotor converts the wind energy into a rotation. The energy within the wind turns two/three mechanical device like blades around a rotor. The rotor is connected to the most shaft that spins a generator to form electricity. Figure 2: Circuit diagram of wind fed DFIG. Converter is reborn the AC / DC voltage into DC voltage. The measuring instrument is required to get the rotor position from its speed. The part loop lock (PLL) is needed to get the stator coil flux position. These angular positions square measure employed by the abc/dq module that offers the rotor d-axis and q-axis currents. The AC/DC/AC device is split into 2 components: the rotor-side device (Crotor) and therefore the grid-side device (Cgrid). Crotor associated Cgrid square measure Voltage-Sourced Converters that use forced-commutated power electronic devices (IGBTs) to synthesize an AC voltage from a DC voltage supply. A condenser connected on the DC aspect acts because the DC voltage supply. A coupling inductance L is employed to attach Cgrid to the grid. The three-phase rotor winding is connected to Crotor by slip rings and brushes and therefore the three-phase stator coil winding is directly connected to the grid. The facility captured by the turbine is reborn into wattage by the induction generator and it's transmitted to the grid by the stator coil and therefore the rotor windings. with ωw being the turbine rotor speed. Wound rotor induction generators (WRIGs) square measure supplied with 3 part windings on the rotor and on the stator coil. They will be equipped energy at each rotor and stator coil terminals. Hence they're referred to as doubly-fed induction generators (DFIGs) or double output induction generators (DOIGs) within the generator mode. Each driving and generating operation modes square measure possible provided the facility electronic converters that offer the rotor circuit via slip-rings and brushes square measure capable of handling power in each direction. The thought high power wind energy conversion systems (WECSs) square measure supported doubly fed induction generators (DFIGs). The stator coil windings of DFIGs square measure directly connected to the grids, and rotor windings square measure connected to the grids through succeeding power electronic converters. The back to back device consists of 2 converters, Rotor aspect device (Crotor) and grid aspect device (Cgrid) that square measure connected back to back as shown in Figure 3. Between the 2 converters a dc-link condenser is placed, as energy storage, so as to stay the voltage variations within the dc-link voltage little management of the DFIG is additional sophisticated than the management of a customary induction machine. Figure 3: DFIG with wind. In order to manage the DFIG the rotor current is controlled by an influence convertor. 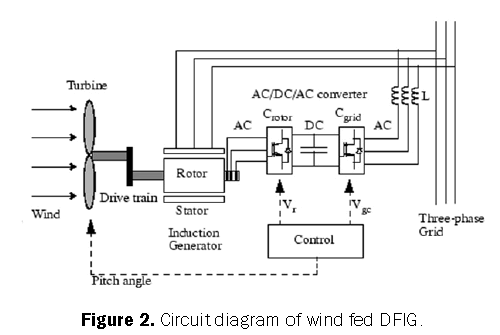 Wind turbines use a DFIG consisting of a WRIG associated an AC/DC/AC power convertor. The entire system is that the machine-side device controls the speed, whereas the grid-side device controls the dc-link voltage and ensures the operation at unity power issue (zero reactive power). By means that of a biface device within the rotor circuit the DFIG is ready to figure as a generator in each subsynchronous and super-synchronous modes. Relying upon the operational condition, power is fed in to or out of the rotor (which is that the case of super synchronous mode), then it flows from the rotor via the device to the grid. where the variables Vds, Vqs, Vdr, Vqr represent the d/q system parts for the machine stator coil and rotor voltages. Variables ids, iqs, idr, iqr signify the machine stator coil and rotor current within the d/q system. The machine fluxes within the d/q system square measure conferred by the variables ѱds, ѱqs, ѱdr, ѱqr. Finally, variables ωs and ωsl square measure stator coil and rotor current frequencies in rad/s, severally. Parameters Rs and Rr represent rotor and stator coil resistances. Parameters J and B represent the generator inertia and therefore the mechanical friction constant, severally. Metal is that the mechanical torsion provides by the blades. The doubly fed induction generator (DFIG) and therefore the synchronous generator square measure delineated by the pure mathematics differential model within the dq system. The device controllers of the DFIG have a posh model such as every mode of operational delineated. In traditional mode operation, the rotor-side device controls the injection of reactive power and therefore the developed power (Pelec). In fact, the utmost power depends on the rotor speed and on the incoming wind. During this operation purpose the optimum power reference (Popt) is calculated taking into consideration the best rotor speed for the incoming wind by the maxim sum worth of the Cp curves. Associate encoder will offer the generator rotor position (θ) to the abc-dqo and to the dq0-abc transformations. The direct axis element is employed to keep up the generator power think about one chemical element therefore, the absorbed reactive power reference (Q*) is adequate zero. The construction axis element is controlled during a similar manner of the direct axis, however, it regulates the electrical power to the best worth (Popt). The Cupid's disease and Vq reference signals square measure send to the dq0-to-abc transformation and, then, to the signal generator supported the PWM (Pulse breadth Modulation) methodology. Finally, Vabc are the three phase voltages desired at Crotor output. In normal mode operation, the Cgrid control regulates the voltage of the DC link between Crotor and Cgrid. In fact, controlling this voltage is another way of doing the control of the active power produced in the rotor windings. The controller employs a PLL (Phase secured Loop) to give the angle (φ) to the bedrock to dq0 (and dq0 to abc) transformation. This angle gives the relation to the synchronization of the three-phase voltages of the converter output with the terminal voltage. The direct axis component is employed to control the DC link voltage (Vdc) to 1 p.u. The quadrature axis component of the reference current is set to zero (Iq = 0) since the power factor control is already been doing by the Crotor. The Vd and the Vq references signals are sent to the dq0-to-abc transformation, then, to the PWM signal generator. Finally, Vgrid are the three-phase voltages desired at the grid-side converter output. The controller’s performance is evaluated and therefore the effects of associate electrical disturbance on the mechanical elements of turbine square measure enforced in Matlab/Simulink package. The voltage and currents transients considerably modification the generator active and reactive powers. The controller capability to stabilize the DFIG signals, once the demanded active power changes or once a brief circuit happens at the generator terminal, is tested. It takes concerning zero.3 second to the controller to stabilize the DFIG signals to their steady values. The wind generation generator is thus capable to support the facility grid frequency once the demanded power changes. This quick response ought to increase the DFIG fault ride-through capability. The full circuit of the DFIG management is meant in Matlab/Simulink by mistreatment simscape blocksets as seeded in Figure 4. It contains the turbine model, drive train model, pitch management, rotor management. The circuit style has been evaluated by connecting the block sets with each other. 3 part AC supply has been generated by mistreatment DFIG and it's connected with three part grid. A rotor aspect and grid aspect management has been designed in Matlab simulink. 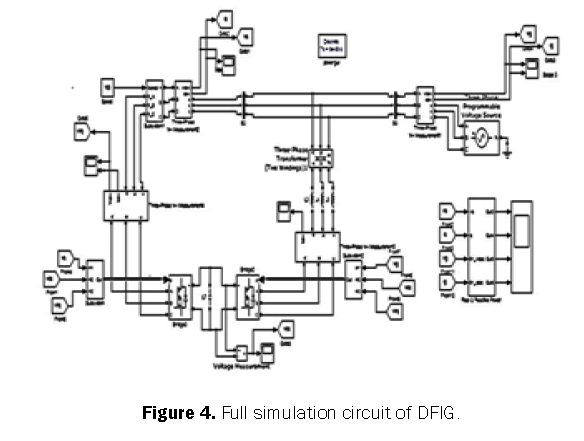 Figure 4: Full simulation circuit of DFIG. The turbine may be a pitch controlled one. The pitch angle β management signal comes from the DFIG management block. The Cp coefficient is calculated through a look-up table and therefore the output of the turbine block is that the torsion on the induction generator axis. The pitch angle β is merely varied to limit the over speed of the generator as shown in Figure 5. 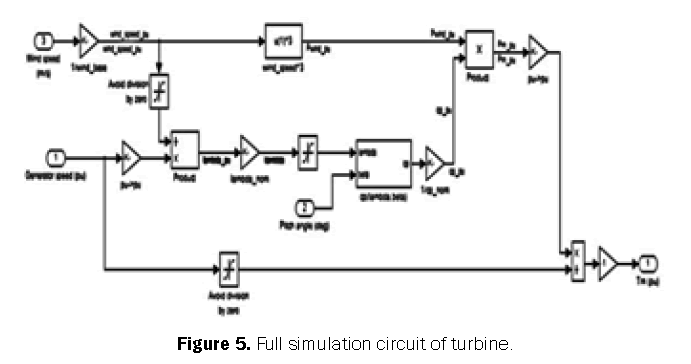 Figure 5: Full simulation circuit of turbine. To properly describe the model of a turbine, initial we have a tendency to should begin with presenting the total model of a turbine. It implements a variable pitch turbine model. The performance constant Cp of the rotary engine is that the mechanical output power of the rotary engine divided by wind generation and a perform of wind speed, motility speed, and pitch angle (beta). The drive train is that the mechanical a part of the system that consists of casing, shafts, rotary engine and different vital mechanical elements. during this project, the 2 mass drive train models square measure used and is conferred. The 2 mass drive train models square measure used attributable to the very fact that the rotary engine model is delineated together mass, whereas the generator is that the different mass. each plenty square measure connected with a mechanical shaft that possesses sure damping and stiffness worth as shown in Figure 6. Figure 6: Full simulation circuit of drive train. The model of the Ig is an instant values full order one, i.e. fifth order with the derivative of the stator fluxes included. This is the best choice to accurately simulate transients in the power systems when the electrical dynamics of the IG is of primary interest. Saturation is not included in the model, but reference states that this only leads to small negligible errors in the prediction of the maximum short-circuit current. The Cgrid is modeled using a universal bridge model with Mosfets connected to the IG terminals through a series RL filter. The control of the Cgrid aims at keeping the DC-link capacitor voltage constant at nominal value. It doesn't contribute to grid voltage regulation or reactive power injection (Iq=0). This can be a limitation, since reactive power injection through the Cgrid serving to during a quicker voltage recovery. The device most power is 0.5 the Ig rated power. The grid voltage angle is calculated with a PLL. The reference for the reactive power is set through a PI controller by mensuration the grid voltage and scrutiny it with a reference. The rotor aspect device is modelled employing a universal bridge model with Mosfets connected to the Ig rotor windings. The Crotor controls the active power delivered by the DFIG, by decisive a torsion reference. This torsion reference is employed at the side of a flux estimate to work out the reference rotor current Idr. The Crotor model has been changed therefore to support the grid voltage with reactive power injection. The reference for the reactive power is set through a PI controller by mensuration the rotor voltage and scrutiny it with a reference. The output of three phase voltage and current of the rotor is shown in Figure 7. 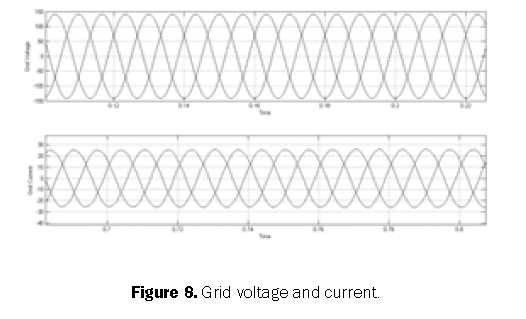 The output of three phase voltage and current of the grid is shown in Figure 8. The real and reactive power compensation is shown in Figure 9. The general and control parameters are used in the simulation of this project as shown in Table 1. Figure 7: Rotor voltage and current. Figure 8: Grid voltage and current. Figure 9: Real & reactive power. Table 1. The general and control parameters are used in the simulation of this project. Rahimi M and Pamiani M. Transient performance improvement of wind turbines with doubly fed induction generators using nonlinear control strategy. IEEE Trans Energy Conversion. Feng W, et al. Stering, Decentralized nonlinear control of wind turbine with doubly fed induction generator. IEEE Trans. Power Systems.2008; 23:613–621. Lie x and Cartwright P. Direct active and reactive power control of DFIG for wind energy generation,” IEEE Trans. Energy Conversion. 2006; 21:750–758. Muller S, et al. Doubly fed induction generator systems for wind turbines. IEEE Indus. Applications Magazine.2002; 8:26–33. Hughes FM, et al. Control of DFIG-based wind generation for power network support. IEEETrans. Power Systems. 2005; 4:1958–1966. Krause PC, et al. Analysis of Electric Machinery and Drive Systems, second edition, USA, Wiley-Interscience. 2002.